There is a bug in version 1.0 where, for 12h mode you would get your mwselog.txt spammed with error messages (basically a hour from 12am/pm to 1pm/am, for real time mode only) and clock wouldn't work as expected, probably. Pushed fix. What mod do you use for the minimap at the bottom? anybody know how this mod works with Water Life? in which you receive a ring that lets you allow/determine realtime hours to in-game hours. Might I ask how you install the mod? I've placed the files in the Data Files folder but nothing has appeared ingame. Yes!! I have wanted this for SO long. I'm surprised nobody made this mod sooner, kudos to you sir. This is a great mod but unfortunately the real time setting doesn't display the correct time for me. Is there any way to correct this? A simple but great mod. Can't play without. Endorsed and gave you my vote. Many thanks for sharing. 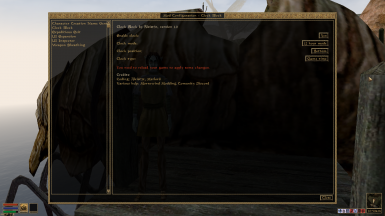 I use a very similar mod for Skyrim, so this is good to have for my beloved Morrowind. Keep up the good work!